It’s always a great day to be part of the IVMF’s Enrollment Services Team, but it’s an even better day when we can greet you from beautiful Fort Drum, New York – home of the famed 10th Mountain Division! 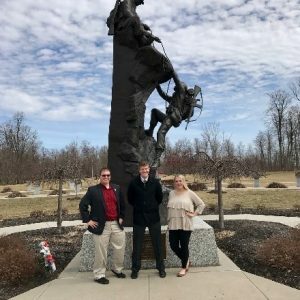 Though we usually are servicing you by phone or email from our office at Syracuse University, we had the unique pleasure of putting “boots on the ground” at Fort Drum and meeting some of our students in person in March. Enrollment Services acts as IVMF’s “front door” to folks interested in our programs and services. With this important duty, you will often find us at-the-ready, typing away, or on the phone. We interface with many, many transitioning military members, veterans, and spouses on a daily basis. We have the distinct pleasure of learning about each individual we interact with, and finding ways to connect them with IVMF programs that can best serve them. With Onward to Opportunity in Partnership with Veterans Career Transition Program (O2O-VCTP) participants, our method of communication is quite rich but short. We learn about their experience, and then proceed to make training recommendations that are inclusive of their career goals. We often do not get to meet our learners face-to-face and certainly not in their environment. 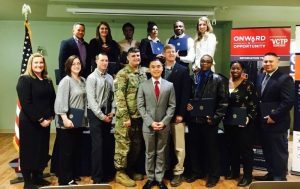 We were thrilled to attend a graduation ceremony of Fort Drum’s second O2O-VCTP cohort. What we learned got us thinking about what we do on a daily basis—and how we might do what we do even better. Our visit to Fort Drum highlighted us two main things that will help us better serve our service members and spouses. First: Command support during transition is critical. During his graduation ceremony remarks, O2O-VCTP graduate Christopher Thoma thanked his unit and command first for allowing him to participate in transition training. Military personnel in transition are often juggling various duties and out processing requirements right up until their transition date. These competing priorities may not allow much time to prepare for the transition to civilian life. Transitioning service members need the full support of their chain of command to successfully find a new job and career path. Second: Spouses deserve opportunities, too. Spouses are eligible to participate in O2O-VCTP and are key participants. Spouses are often in the midst of managing family matters during deployment, raising children, and volunteering with many organizations. With more and more jobs offering remote work and flexible hours, spouses more than ever are looking to move back into the workforce. However, spouses often are challenged to find the time to invest in themselves – O2O-VCTP’s course delivery helps meet that challenge. 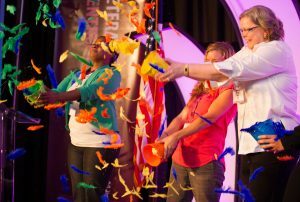 It was so moving to hear that some graduating O2O-VCTP spouses had already found employment through O2O-VCTP’s employer partners in the Hire Heroes USA network! All of our O2O-VCTP graduates are now busy paying it forward, sharing their experiences with the program, and starting meaningful careers. We have the honor of playing a small role in helping them achieve their professional goals, getting to know them as individuals, and to serving all those who have served. Give us a call, or drop us an email—we are ready to assist you in taking the next steps toward your own transition!